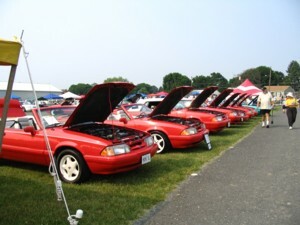 The third gathering of Mustang LX 5.0 Convertibles is being planned for the 2009 Carlisle All-Ford Nationals from June 5-7, 2009 in Carlisle, PA. Following, is information that should answer some questions you might have. It is still very early in the planning process so everything is not yet known. The most exciting change for 2009 is the possibility of a feature car class just for our limited editions. 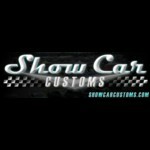 If we can get 10 cars pre-registered by the May 18, 2009 cutoff date, we will be given that class. In order for this to happen we have to be motivated to get registered. Please follow the directions listed below and notify me of your intentions. Read the Carlisle 2009 section of my blog for updates. For some history from prior years, see below. 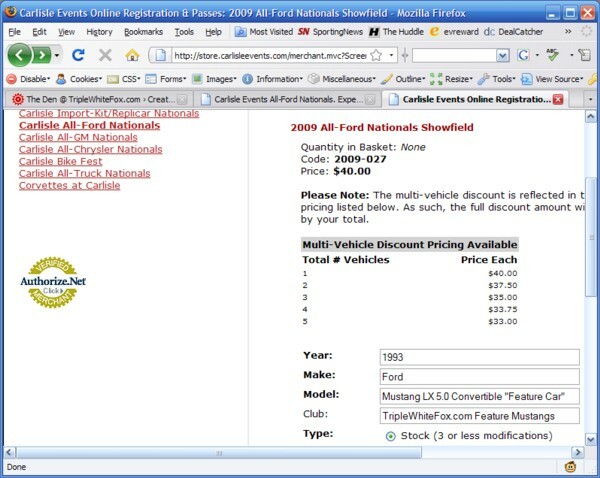 Registration is open for Carlisle All-Ford Nationals 2009! Go to www.carsatcarlisle.com to register. When you register, you will need to communicate to them that you are part of triplewhitefox.com. This will help them to group us together. Please let me know once you have registered so I can keep track of how many people are going. Specify "TripleWhiteFox.com Feature Mustangs" as your club when registering. Let me know once you have registered so I can assess where we are in meeting the goal. Even if we do not get 25 cars it still will be a great time! If we don't qualify for a free tent we can still get one for a $160 fee. I will pay the upfront cost and, if required, look to have people who attend help out by contributing $10 each.